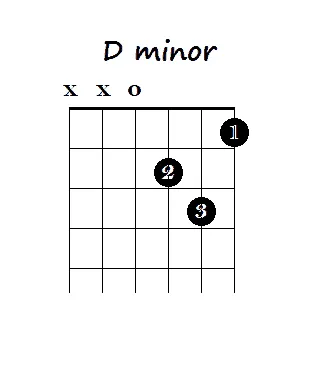 The following basic guitar chords for beginners will form the foundation of your chords. Learning these chords and their shapes will help you in learning many other chords. 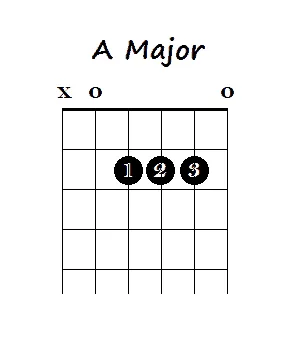 Not only that, there are also hundreds of songs you can learn that involve just these basic open chords. The first part of this post will explain how to read chord charts and then move onto the chords. The chords that will be covered in this post are. So that you can understand this post – and chord charts wherever you come across them – I have explained how the chord charts work in the diagrams below. Imagine a guitar leaning against the wall. This is the view of the chord chart. The “x” and “o” symbols above the strings indicate whether that string should be played or not. 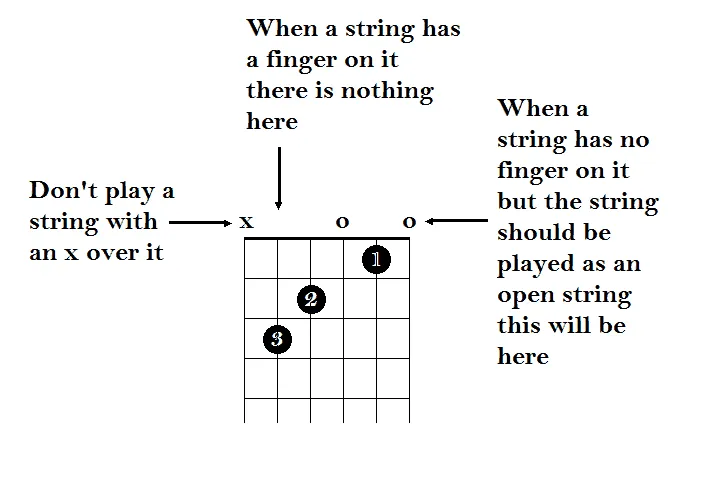 The “x” means that you do not strum that string and an “o” means that you strum that string as an “open” string. Where there are fingers on the strings there is neither an “x” nor an “o”. You should always strum these strings. This might be confusing for some at first but you will get used to these diagrams and they will get easier to read fairly quickly. 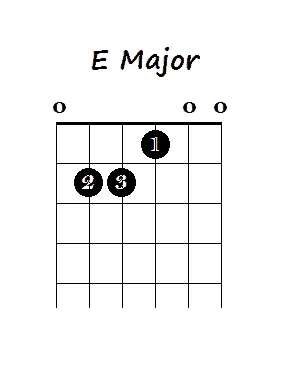 For the E Major chord I will go through and explain how it is to be played. 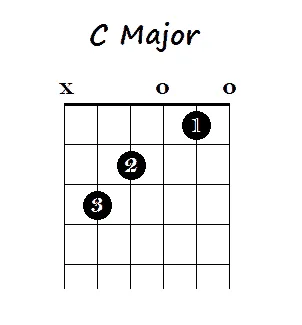 For the remaining chords I will just show the diagram because the diagram will describe what you should be doing. If in doubt refer back to the “Getting Ready” charts above. You should strum all of the strings. The Low E, B and E strings will be strummed as open notes. Very similar to the E Major chord – you just have to lift off your 1st finger. 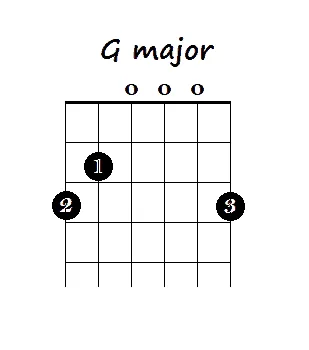 The alternative to playing the A major is to swap around the 1st and 2nd fingers so that the 1st finger is on the G string on the 2nd fret and the 2nd finger is on the D string on the 2nd fret. To get the best sound possible you want to get your fingers as close to the front edge of the fret as you can. 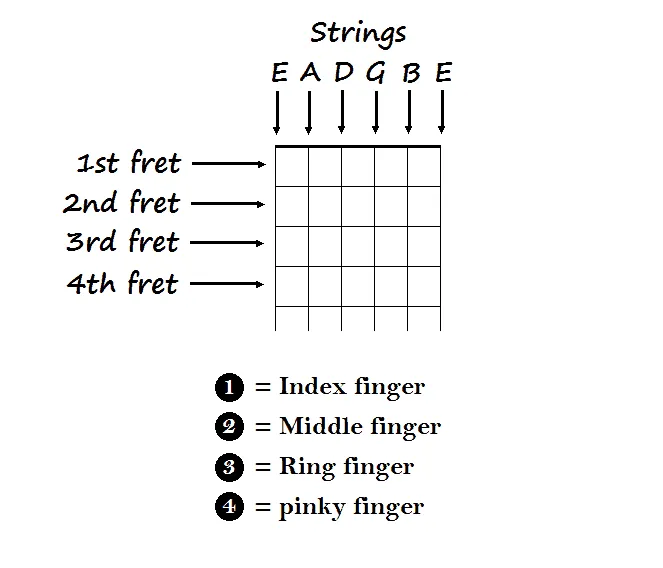 Because you have 3 fingers all trying to fit into the 2nd fret for the A major chord some people find it easier to have the first finger on the G string to try to get it closer to the edge of the fret. Note that you aren’t going to be able to get all 3 fingers right to the front of the fret whichever way you do it. Just try to get that 1st finger somewhere in the middle and not right to the back of the fret. You’ll know what I mean when you try the chord. For an alternative G major open chord you can bring in the 4th finger. Move the 3rd finger up to the B string 3rd fret and place the 4th finger on the high E string 3rd fret. 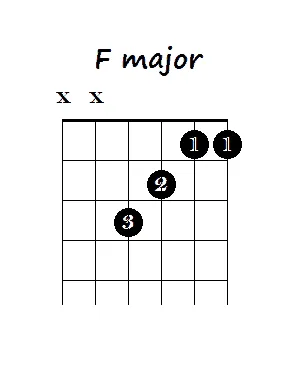 The F chord is perhaps the most difficult of the open chords in this list. 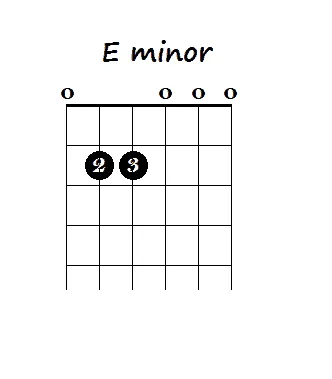 You need to bar both the B and high E strings with your first finger and you also need to make sure you miss both the Low E and A strings as you strum. Although if you play the A string it won’t matter too much as there is an A note in the chord so it will still sound fine. However it won’t sound right if you play the Low E string. How I like to play this chord is to mute the Low E string with my thumb (bringing it over the neck of the guitar) and to mute the A string with the tip of my third finger but this might be too difficult to start with – so you can start out just making sure you miss the Low E and A strings as you strum. Over to you now. The more you practice the more natural these chords become. You should also practice transitioning between the different chords. For more chords plus video lessons on how to play them and some good techniques on how to transition it’s a good idea to check out some online video lessons. Check out my online lesson reviews in the menu above. There are both free and paid lesson reviews there. If you are going to go for paid lessons the best that I’ve seen so far is Jamplay. 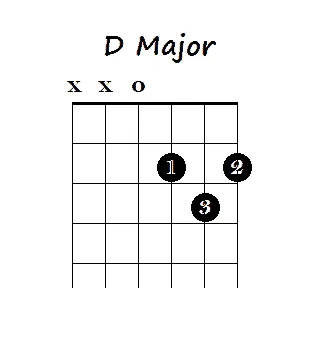 If you have any questions or comments about the chords in this post please feel free to leave a comment in the comments section below. You can check out my post on the best guitars under $1,000 if you like (see link below). Although this is probably going to be a bit out of your price range if you are just starting out. I am looking to review some cheaper guitars soon but am yet to do so – check back in a couple of months and there should be some reviews up. Yamaha and Seagull have some great guitars that are cheaper – you could check out those brands for some of their lower price range models. The Seagull S6 series guitars have a great reputation for being great sounding guitars for a low price so they’d be worth checking out I reckon. I love your post! It really took me over 30 years back in time when I picked the guitar for the first time in my life. There was ni internet back than and nio chance to learn anything that way. I got the book to learn from but it wasn`t clear like your post. Thanks for the article, it was a pleasure reading it. Thanks for your kind words. Glad you liked the post. Yeah there was no internet when I first starting learning either – at least not in the way there is today. Only the kind where it took an hour and a half to download 1 low quality picture over a local network! Great to hear from such an experienced player. I hope beginners find the post as easy to understand! Good article making learning to play the guitar simple and easy for anyone to do, playing any instrument has many benefits and is good for the body and the mind. How long have you been playing the guitar, what would you recommend as a good beginner guitar for a teenager? I agree that learning an instrument has many benefits – for adults and kids a-like. Check out the following link for some good beginner guitar options. Most of the options there are smaller in size – which is a good idea for a beginner guitar – often even for adults. 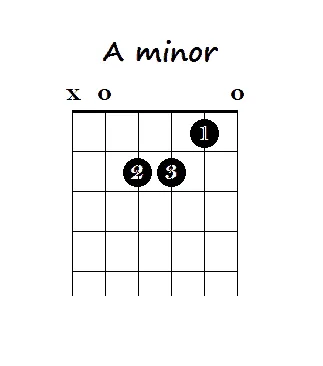 Enjoyable and informative article on learning basic guitar chords. Thanks. This is very informative. I am 41 and just starting to learn the guitar. Hahaha Hope this is not too late for me. lol I learned some basic chords but I wonder why it doesn’t sound good even as I followed where to put my fingers on the strings on the said chord. Just learned in your post that there are chords that I shouldn’t strum some strings. Hahaha Following your instructions here, not strumming those with x sign, it sounds good now. Hahaha Thank you very much, Nate. God bless you. It’s never too late to learn guitar. And yeah, important that you strum the right strings as well as getting the fingers in the right frets. Glad that the chords are sounding better now.